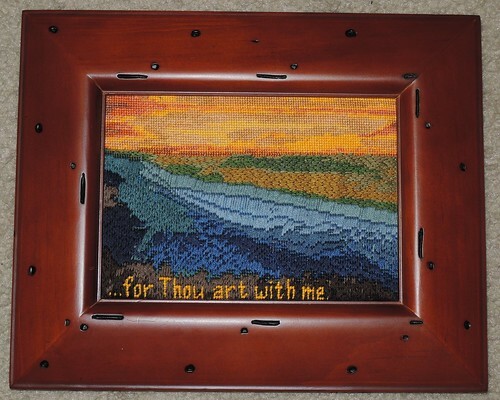 I chose a rustic wood frame to give the piece warmth. Valley of Shadow – Framed, a photo by Carmen CS on Flickr. Prayer: Father, I hold them up to You for the rest of their lives. Valley of Shadow – Stitched! 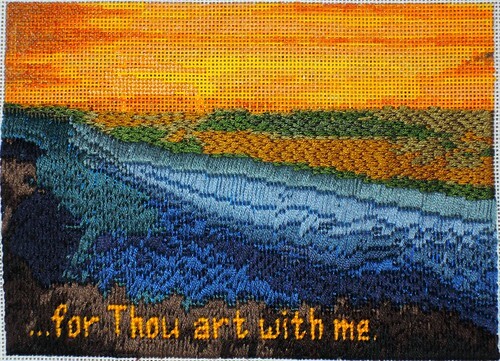 And here it is completely stitched! Valley of Shadow – Stitched!, a photo by Carmen CS on Flickr. Prayer: Father, I pray that You stay with them and grant them peace and healing without end. 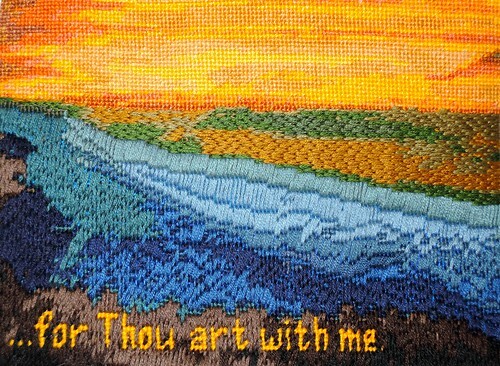 I blended two threads of variegated fiber with four solid DMC cotton fibers to make the fibers for the sky. This will liven the sky up and make it look more real and interesting. Valley of Shadow – Sky Fibers, a photo by Carmen CS on Flickr. Prayer: Father, let Your light shine into the valley and bring them hope. As you may know, I LOVE variegated thread! 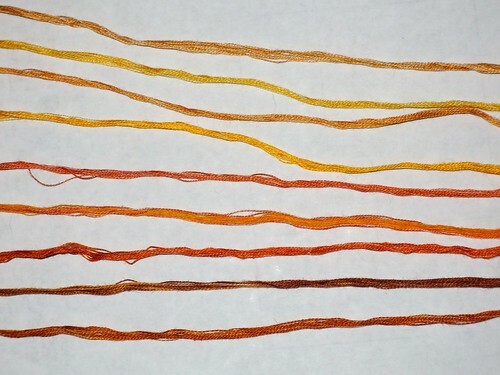 For this project, I found some hand-dyed cotton floss on eBay! 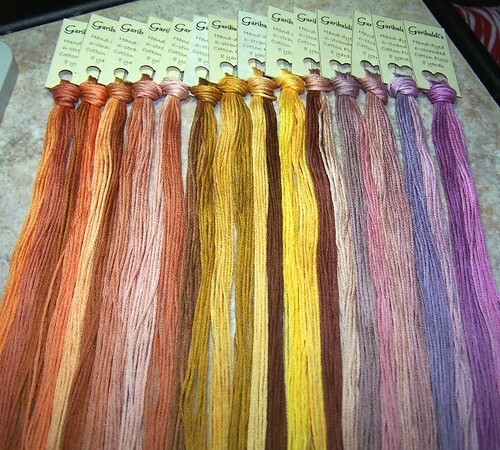 Garibaldi’s Hand-dyed Cotton Floss, a photo by Carmen CS on Flickr. Prayer: Father, I pray for little joys and beauties in their lives! Here are the far hills, completely stitched. Valley of Shadow – Far Hills, a photo by Carmen CS on Flickr. To make the flat, split texture, I have to begin a column on the left and add stitches always on the right. 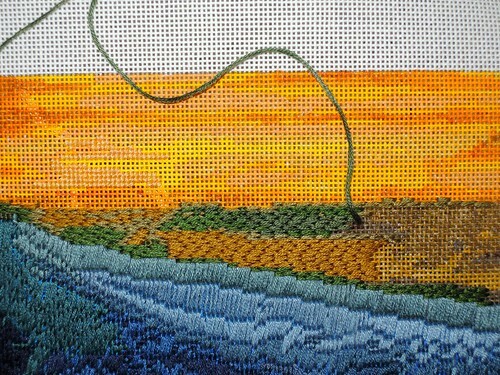 To stop myself from having to start and end threads too often, I need to keep several colors threaded at once. Tricky! 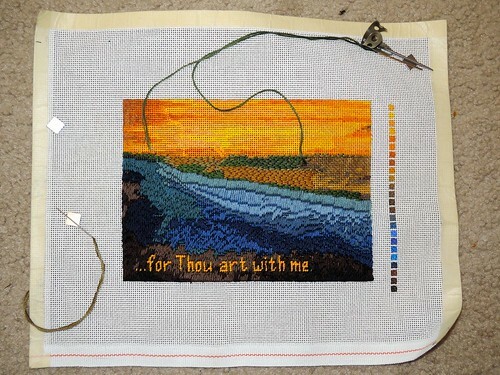 Valley of Shadow – Flat Horizontal Stitching, a photo by Carmen CS on Flickr. Prayer: Making it through the valley is not straightforward. Healing can be painful, draining, challenging. Father, give them the strength to heal! The hills on the far side of the valley are seen through streaky haze. To give this impression, I’ve gone with horizontal stitches making a fairly flat texture. Prayer: Beyond the valley there is land, land which is green and growing. Although it seems far away, and maybe even inaccessible while they are in the valley. Father, I pray that they find their way out of the valley into the life beyond.